Pacemaker technologies have advanced dramatically over the decades since they were first introduced, and every year many thousands of new implants are performed worldwide. However, there continues to be a high incidence of acute and chronic complications, most of which are linked to the lead or the surgical pocket created to hold the device. A leadless pacemaker offers the possibility of bypassing these complications, but requires a catheter-based delivery system and a means of retrieval at the end of the device’s life, as well as a way of repositioning to achieve satisfactory pacing thresholds and R waves, a communication system and low peak energy requirements. A completely self-contained leadless pacemaker has recently been developed, and its key characteristics are discussed, along with the results of an efficacy and safety trial in an animal model. The results of the LEADLESS study, the first human trial to look at safety and feasibility of the leadless device, are discussed and the possible implications for future clinical practice examined. Acknowledgement: The speaking panel acknowledge Radcliffe Cardiology for providing writing and editorial support. Arrhythmia & Electrophysiology Review 2014;3(1):51-5. In 1958, the world’s first patient was implanted with a pacemaker. It brought numerous benefits, the most important of which was increased survival. Since then, pacemaker technology has evolved with the development of improved device longevity, by including a high-energy density battery and utilising high impedance, low threshold leads. Implantable pulse generators (IPGs) for cardiac arrhythmias are now a proven and widely used treatment method. A worldwide cardiac pacing and implantable cardioverter-defibrillator (ICD) survey found that in 2009 there were over 700,000 new implants, with the majority of these implants being performed in the US and Europe, but the greatest growth occurring in Asia.1 Despite new developments in pacemaker technology, there is still a high incidence of pacemaker-related complications.2 A large prospective multicentre study found that after two months 12 % of patients present with acute complications (see Figure 1).3 Chronic complications subsequently occur in 10 % of patients. Most of these complications are related to the lead or the surgical pocket created to hold the pacemaker. Local pocket-related complications include haematoma, wound pain, decreased mobility, pocket erosion and infection. Pocket infection can be a serious complication, which occurs in 0.5–1.5 % of implants, but has a mortality of 10 %. Staphylococcus aureus is the main source of infection and is becoming increasingly antibiotic resistant. Pockethaematoma is also a relatively common complication. It is usually benign and treated conservatively but sometimes requires repeated surgery, which can be a major issue in patients who use anticoagulant drugs.4,5 However, the greatest potential for a complication in a pacemaker procedure is related to the lead. The overall incidence of clinical problems related to the lead is around 8 %.6 Mechanical failure and lead dislodgement are relatively common complications. Severe complications require lead extraction, which is performed percutaneously with a laser sheath or mechanical snare. This is a complex surgical procedure, with unavoidable risks, including possible tearing of the surrounding blood vessel or perforating the heart.14–16The concept of a self-contained leadless pacemaker (LP) was first reported in 1970.17 However, the battery did not last more than a few weeks. Following advances in battery technology, endocardial fixation and delivery systems, the concept has been revisited. The requirements of a LP are a catheter-based delivery system and a dependable fixationdesign. It is also important to be able to reposition the device acutely to achieve satisfactory pacing thresholds and R waves, and then retrieve the device chronically after the device has reached end of service. The device should be small to enable percutaneous delivery, with low power electronics and a high-density energy source. This requires a novel communication scheme with low peak energy requirements. The device must be biocompatible and have features comparable to conventional pacemakers in terms of electrical output, battery longevity and other functions such as rate response. Recently, a completely self-contained LP has been developed by St. Jude Medical (see Figure 2). The 1 cc and 2 g device is delivered percutaneouslyvia the femoral vein through a Nanostim™ 18 F introducer with a steerable catheter. It has a docking feature, which allows attachment of the device to a catheter for delivery, repositioning and retrieval. The chemical cell is a lithium carbon monofluoride (Li-CFx) battery, with an equivalent longevity compared with conventional pacemakers. The single integrated circuit chip senses, paces and communicates to a programmer. The chip uses a quarter of the current of standard chips, providing the same longevity as a conventional pacemaker, while reducing battery volume. The device is fixed into the right ventricle (RV) without leads or a surgical pocket. The primary fixation mechanism is provided via a helix and tines add secondary fixation. The distal tip features a steroid-eluting electrode that paces from the tip to the can. The pacemaker functions are the same as standard single chamber rate responsive pacemakers (VVIR) with hysteresis. The standard means of communication via radiofrequency (RF) requires an antenna or a coil and a high active current (5 mA). The Nanostim™ leadless pacemaker therefore features conducted communication involving small electric pulses through the human body that are picked up with standard surface electrocardiogram (ECG) electrodes. This eliminates the need for an antenna or a coil; there is no added circuit module and the system communicates in the refractory period of the heart, and it has low active current of <100 μA. This results in a predicted battery life of 9–10 years with 100 % pacing. Pacing requirements <100 % result in an increase in battery life. The delivery catheter is a single-operator design with three flush/ irrigation ports, an integrated LP introducer and a steerable delivery catheter (see Figure 3) with an expanded polytetrafluoroethylene (ePTFE) protective sleeve that protects the helix during the delivery and repositioning of the pacemaker. The pacemaker is implanted as follows: the LP is placed into the 18 F sheath through the LP introducer, the device is advanced through the 18 F sheath up the inferior vena cava, where it is covered with the protective sleeve and then advanced into the right atrium. Under fluoroscopic guidance, the delivery catheter with LP isdeflected through the tricuspid valve, into the RV and positioned near the apex or lower septum. Contrast is injected through the protective sleeve to opacify the RV and establish the desired positioning of the LP. The protective sleeve is then pulled back to fully expose the pacemaker and the LP is slowly advanced until it reaches the endocardium. It is fixed in position by rotating the catheter handle and observing under fluoroscopy one and a quarter rotations of the radiopaque marker inside the LP. There is also a tether mode that enables the implanter to perform a tug test confirming secure LP implant and facilitates more accurate electrical testing for pacing and sensing thresholds. If the values are unsatisfactory, it is possible to re-dock the pacemaker, unscrew it and place the sleeve over the pacemaker to allow repositioning. When satisfied with the threshold values, the operator can fully release the pacemaker. The delivery catheter is then removed and the pacemaker resides in the RV, fully functioning (see Figure 4). Follow-up data over six months indicate that the thresholds remain very low. Simple and efficient percutaneous retrieval is a necessary capability for an LP in case of infection or at end of service. The Nanostim™ Leadless Pacemaker has unique design features that simplify this process. The docking button is flexible, easily snared and allows for the unscrewing of the device. Retrieval is achieved via femoral access, and the retrieval procedure is a single-operator system. The catheter is deflectable and steerable and has a snare closure dock, which can be positioned independently from the retrieval catheter. Two forms of retrieval catheter are available, the triple loop snare system and the single loop. The loop is positioned over the docking feature of the LP, the snare is closed and locked and then the retrieval catheter is docked with the LP. The protective sleeve is advanced over the device and the LP is then unscrewed and removed through the tricuspid valve and out the femoral vein. A pilot study of the retrieval procedure was performed in 10 sheep.18 After an implant duration of more than five months (159–161 days), the retrieval of the LP system was performed with an 18 F introducer sheath via the right femoral vein. The retrieval catheter was introduced into the RV and positioned at the proximal end of the LP behind the docking feature under fluoroscopic guidance. In five sheep, gross necropsy was immediately performed and in the other five sheep a re-implantation of the device was performed, followed by gross necropsy after six weeks. The average time to snare the device was 1:48 minutes (min) (range: 13 seconds [sec] to 3:58 min) and the average total retrieval time was 2:35 min (1:00–4:04 min). For the five successful replacements of the devices, the average delivery time was 2:48 min (2–3 min). Upon examination of the gross pathology, no embolisations or perforations were observed. All animals were assessed by a veterinary pathologist. Mild endocardial fibrosis was observed at the free wall (range 1.0–3.5 cm) and the septal wall (range 1–3 cm). All cardiac valves were normal in appearance. All LPs were implanted securely and were relatively free of connective tissue or thrombus at the distal tip. There was no evidence of pulmonary thromboembolism and, importantly, the original implant site in the heart could not be identified by the pathologist after the replacement of the device. In summary, this study has demonstrated the feasibility, safety and efficacy of retrieval of the LP from the RV. It also demonstrates the ability for re-implantation of a new LP after successful retrieval. Further studies will be necessary with longer term implantation and more subjects to assess the safety and efficacy of chronic retrieval. The LEADLESS study was a feasibility study to evaluate the safety and performance of the LP.19 This was a prospective, non-randomised, single-arm, multicentre study, conducted at three European sites. The study population (n=33) comprised patients aged 18 years and over who were indicated for a VVIR pacemaker and were not pacemaker dependent. Inclusion criteria were: chronic atrial fibrillation (AF) with second or third degree of atrioventricular (AV) block, or normal sinus rhythm with second or third degree of AV block and a low level of physical activity, or sinus bradycardia with some infrequent pulses and unexplained syncope. Other criteria included life-expectancy of more than one year. Patients were required to comply with clinical investigation procedures and agree to return for all follow-up visits, tests and exams. Exclusion criteria were: pacemaker dependency; known pacemaker syndrome, retrograde ventriculoarterial (VA) conduction or suffering a drop in arterial blood pressure with the onset of ventricular pacing; hypersensitivity to <1 mg dexamethasone sodium phosphate; mechanical tricuspid valve prosthesis; pre-existing pulmonary arterial hypertension or significant physiologically-impairing lung disease; pre-existing pacing or defibrillation leads; current implantation of an ICD or cardiac resynchronisation therapy (CRT); presence of an implanted vena cava filter; and presence of an implanted LP. The study procedure involved femoral vein assessment and access, LP delivery, positioning, assessment and programming. Postprocedure assessments included X-rays of the pacemaker, and LP assessment and programming. Parameter assessments were performed at implant, discharge, two weeks, six weeks and 90 days. At two-week follow-up, a six-minute walking test was performed, as well as LP assessment and programming. At six weeks, the six-minute walking test was performed with the rate-response feature on, as well as LP assessment and programming, which was also performed at six months. The mean age of patients was 75 (range 53–91), 64 % were male and 36 % female. The majority (60 %) had chronic AF and second or third degree heart block, 24 % had sinus rhythm with low activity or shortlifespan and 28 % had infrequent pauses or unexplained syncope. Implantation success was achieved in 32 of 33 patients (97 %). 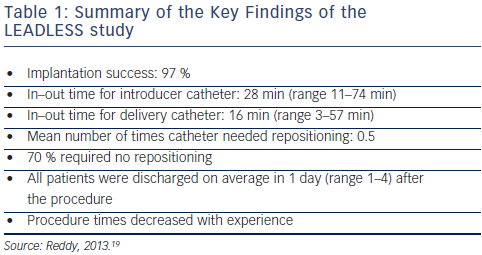 In terms of procedure times, the time from placing the introducer into the femoral vein to taking it out was 28 min (range 11–74 min) and for the delivery catheter 16 min (range 3–57 min). The mean number of times the catheter required repositioning was 0.5. No repositioning was required in 70 % of patients and only two patients needed repositioning of the LP three times. On average, patients were discharged one day (range 1–4) after the procedure. There was an experience effect with procedure times decreasing over the course of the study. 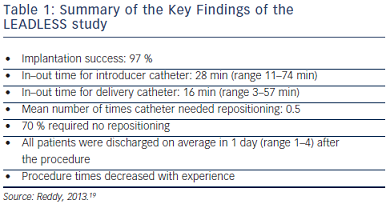 By the end of the study, catheter in/out time was less han 20 min. Safety endpoints for the study included one minor groin haematoma that did not require treatment. One serious complication occurred – cardiac perforation and tamponade in a 70-year-old man, with chronic AF. The patient was treated surgically, but the patient sustained a stroke five days after the operation. A computerised tomography (CT) scan showed occlusion of the right internal carotid artery causing oedema in the right cerebral hemisphere and the patient died. It is not believed that this complication was directly attributable to the use of the LP. Pacing threshold was 0.8 V at implant and dropped to around 0.5 V over 12 weeks, a similar change to that seen in traditional pacemaker implantation. R wave amplitudes and impedance changes over time were consistent with that expected in traditional pacemakers. The percentage of patients who were pacing was approximately 40 % at the end of the observation period. Retrieval of the device was required in two patients. In the first, the device was implanted in the apex of the heart and achieved good sensing and pacing thresholds. After catheter release and removal, it was realised that the LP had transited into the left ventricle via a patent foramen ovale (PFO). Heparin was administered intravenously, a retrieval catheter introduced and the LP removed in around six minutes. Another LP was then implanted into the RV apex. The second patient was an 86-year-old man, with syncope and AV conduction disease. The LP was successfully implanted at the RV apex, but after discharge from hospital, the patient sustained repeat syncope, came to hospital and had spontaneous ventricular tachycardia (VT) in the hospital. Eight days after implant, the LP was retrieved (procedure time around 13 min) and an ICD implanted. In conclusion, this study has shown that leadless RV cardiac pacing is feasible (Table 1). Furthermore, acute and sub-acute LP retrieval is feasible. 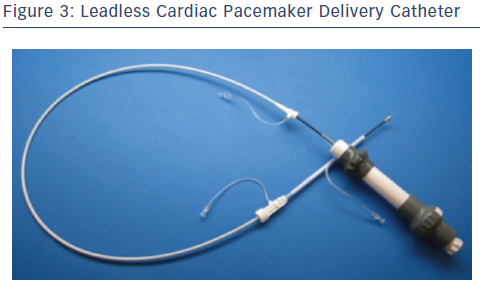 This was a relatively small feasibility study, but raises the possibility of eliminating the major causes of pacing complications – the lead and the surgical pocket required for traditional pacemakers. There are plans to commercialise the technique in Europe this year. There will be a large multicentre US study next year. Future needs include not only single-chamber but also dual-chamber or multichamber cardiac pacing. Leadless RV cardiac pacing is a new therapy and requires further research. The Nanostim leadless pacemaker is currently only capable of singlechamber pacing and does not enable dual-chamber (DDD) or CRT pacing. The device size (almost 4 cm) renders it only suitable for placement in the RV apex or lower septum. Therefore AAI pacing is not yet possible. There are no data on retrieval after long-term treatment. Pre-selection criteria for initial studies should be older patients whose first pacemaker will be their last pacemaker. Following data on retrieval of long-term implants, studies should include young patients who are very prone to lead complications. There may be challenges in the initial use of this novel procedure. There is a need for physician training in this new technique, which may result in learning curve complications. Another consideration is post-mortem removal of the device. In the past, this has been easily done by the funeral organisation or hospital morgue, but the LP will present problems in this respect. However, despite these issues, the device offers benefits in addition to those already mentioned. Testing still needs to be conducted to demonstrate magnetic resonance imaging (MRI) compatibility. A problem associated with traditional pacemakers is that some serious cases of thrombosis have been reported with transvenous leads.20 In the case of the LP, since no lead passes the valve, these problems do not occur. With traditional pacemakers, up to 10 % of patients develop a venous thrombosis in the subclavian vein. Experience of lead extractions shows that in the first two years leads are easy to remove but can become more difficult in the longer term after fibrosis occurs. Another important benefit of this pacemaker is the lack of mobility restrictions for patients; the LP is not tethered to a lead like conventional pacemakers. A patient who receives a traditional pacemaker is instructed not to overuse the arm adjacent to the placement of the pacemaker. Mond HG, Proclemer A. The 11th world survey of cardiac pacing and implantable cardioverter-defibrillators: calendar year 2009--a World Society of Arrhythmia’s project. Pacing Clin Electrophysiol 2011;34:1013–27. van Eck JW, van Hemel NM, Zuithof P, et al. Incidence and predictors of in-hospital events after first implantation of pacemakers. Europace 2007;9:884–9. Udo EO, Zuithoff N, van Hemel NM, et al. 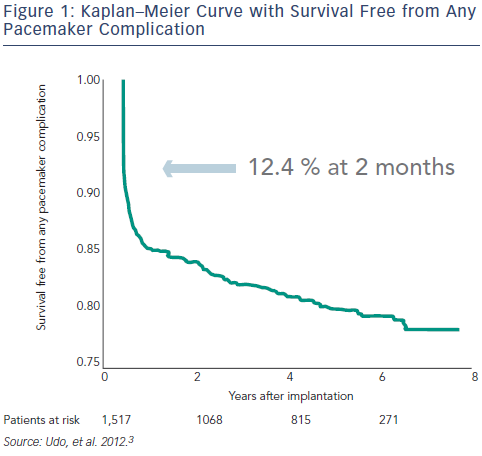 Incidence and predictors of short- and long-term complications in pacemaker therapy: the FOLLOWPACE study. Heart Rhythm 2012;9:728–35. Wiegand UK, LeJeune D, Boguschewski F, et al. Pocket hematoma after pacemaker or implantable cardioverter defibrillator surgery: influence of patient morbidity, operation strategy, and perioperative antiplatelet/anticoagulation therapy. Chest 2004;126:1177–86. Przybylski A, Derejko P, Kwasniewski W, et al. Bleeding complications after pacemaker or cardioverter-defibrillator implantation in patients receiving dual antiplatelet therapy: Results of a prospective, two-centre registry. Neth Heart J 2010;18:230–5. Klug D, Balde M, Pavin D, et al. Risk factors related to infections of implanted pacemakers and cardioverter-defibrillators: results of a large prospective study, Circulation 2007;116:1349–55. Medtronic. Cardiac Rhythm Disease Management, Product Performance Report, 2013 First Edition – Issue 68. Available at: wwwp.medtronic.com/productperformance-files/ Issue%2068%20MDT%20CRDM%20PPR%202013%201st%20 Edition.pdf (accessed 1 April 2014). St Jude Medical, Implantable Electronic Systems Division. Product Performance Report. First Edition, 2013. Boston Scientific. CRM Product Performance Report 2013 Q3 Edition. Available at: www.bostonscientific-international. com/templatedata/imports/HTML/PPR/ppr/references/ report_download_2013_q3.shtml (accessed 1 April 2014). Kirkfeldt RE, Johansen JB, Nohr EA, et al. Risk factors for lead complications in cardiac pacing: a population-based cohort study of 28,860 Danish patients. Heart Rhythm 2011;8:1622–8. van Rees JB, de Bie MK, Thijssen J, et al. Implantation-related complications of implantable cardioverter-defibrillators and cardiac resynchronization therapy devices: a systematic review of randomized clinical trials. J Am Coll Cardiol 2011;58:995–1000. Banaszewski M, Stepinska J. Right heart perforation by pacemaker leads. Arch Med Sci 2012;8:11–3. Howell C, Bergin JD. A case report of pacemaker lead perforation causing late pericardial effusion and subacute cardiac tamponade. J Cardiovasc Nurs 2005;20:271–5. Bracke F, Meijer A, van Gelder LM. 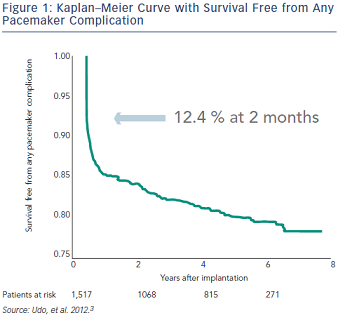 Pacemaker lead complications: when is extraction appropriate and what can we learn from published data? Heart 2001;85:254–9. Buch E, Boyle NG, Belott PH. Pacemaker and defibrillator lead extraction. Circulation 2011;123:e378–80. Maytin M, Epstein LM, Henrikson CA. Lead extraction is preferred for lead revisions and system upgrades: when less is more. Circ Arrhythm Electrophysiol 2010;3:413–24. Spickler JW, Rasor NS, Kezdi P, et al. Totally self-contained intracardiac pacemaker. J Electrocardiol 1970;3:325–31. 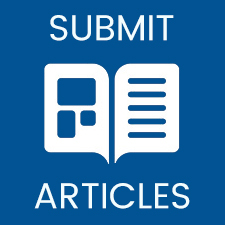 Sperzel J, Khairkhahan A, Ligon D, Zaltsberg S. Feasibility, efficacy and safety of percutaneous retrieval of a leadless cardiac pacemaker in an in vivo ovine model. Abstract 859. Europace 2013;15(suppl 2):ii112–3. 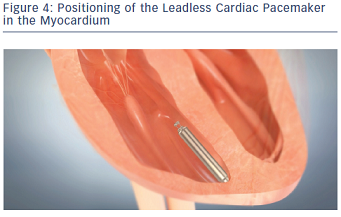 Reddy V. Percutaneous In Vivo Placement Of A Novel Intracardiac Leadless Pacemaker: Results From The First-in-man Leadless Study (SP22, Presentation LB02-01). Presented at: Heart Rhythm Society Meeting, Denver, CO, US, 8–11 May 2013. Barakat K, Robinson NM, Spurrell RA. Transvenous pacing lead-induced thrombosis: a series of cases with a review of the literature. Cardiology 2000;93:142–8. Reddy VY, Knops RE, Sperzel J et al. Permanent leadless cardiac pacing: results of the LEADLESS trial. Circulation 2014; ePub ahead of print.